“If you've ever tried to zone a halfway house (for any special population), you know that an act of Congress won't get it done. It takes an act of God. Mr. Lauber was invaluable to my zoning efforts to obtain a special use permit to operate a community corrections facility for convicted felons in Colorado. Since he remained in Chicago and all the communication was done via phone and email, the details of communication became even more important. I had a failed attempt (at another location) approximately 2 years earlier and was nervous that all my work on this project would end the same way. I contacted Mr. Lauber after reading about his expertise with halfway houses. He partnered with me in the exact manner that I needed. (3) Evaluation of the city’s treatment of community residences for people with disabilities. 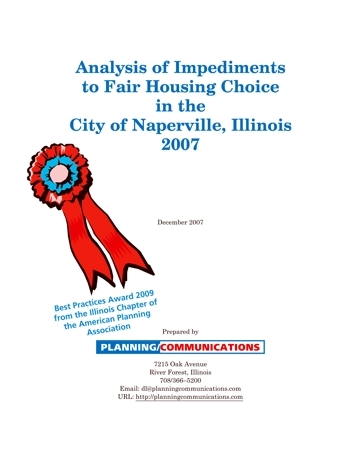 This work included identifying impediments to fair housing choice and recommendations to mitigate those impediments. 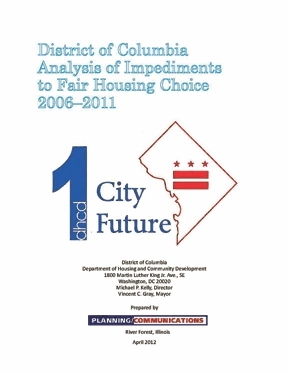 District of Columbia (2012) — Conducted the District of Columbia Analysis of Impediments to Fair Housing Choice 2006–2011, a 195–page study of housing, land use, transportation, employment, demographics, real estate practices, mortgage lending, and other factors that influence fair choice housing in nation’s capital. The government of the District of Columbia has been doing more to affirmatively further fair housing than any jurisdiction we have heard of (sure hope my high school English teachers will forgive me for ending a sentence with “of.”). The challenge the District faces is that its demographics require it to do much more. This new AI goes where no AI has gone before to incorporate affirmatively furthering fair housing into the city’s routine planning and zoning practices and to bring stable racial and economic integration to gentrifying neighborhoods. 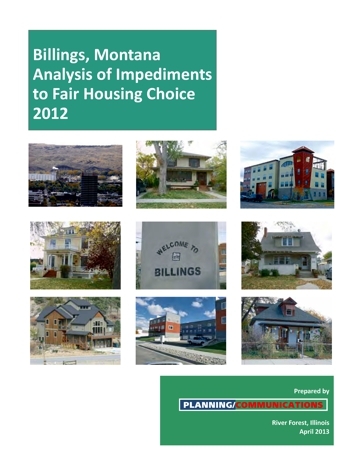 Billings, Montana (2013) — Conducted the Billings, Montana Analysis of Impediments to Fair Housing Choice 2012, a 140–page study of housing, land use, transportation, employment, demographics, real estate practices, mortgage lending, and other factors that influence fair choice housing in Montana’s largest city. Known for favoring diversity over separation and isolation, the City of Billings is in a rare position where it can prevent excessive levels of racial and economic concentrations from expanding and intensifying. This AI offers guidance for collaborating with the public schools and housing authority to achieve greater socio–economic diversity throughout the city. Lakewood, Ohio (2011) — Conducted the Lakewood, Ohio Analysis of Impediments to Fair Housing Choice 2011, a 94–page study of housing, land use, transportation, employment, demographics, real estate practices, mortgage lending, and other factors that influence fair choice housing in this first suburb on the Lake Erie shore immediately west of Cleveland, OH. 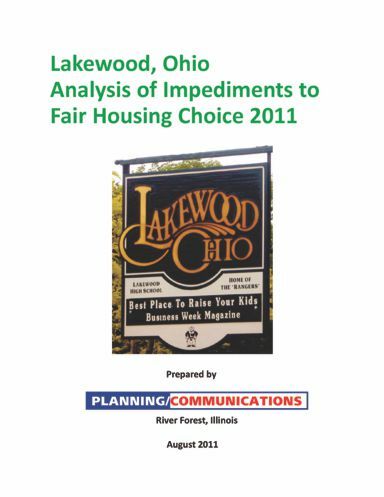 The study found that Lakewood faces a situation dramatically different than that of the other jurisdictions for which we have conducted an analysis of impediments. Lakewood is in the early stages of racial integration in a region known for its extreme racial segregation. Lakewood is exceptionally well situated to achieve stable, racial integration rather than resegregating like so many Cleveland–area communities have done. The analysis of impediments explains in some detail the two–pronged approach Lakewood can take to become a stable, racially–diverse community. 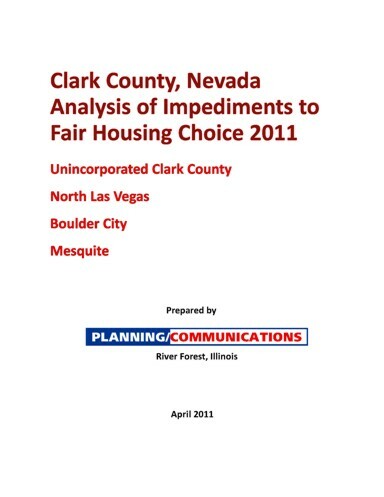 Clark County, NV (2011) — Researched and produced Clark County, Nevada Analysis of Impediments to Fair Housing Choice 2011 for unincorporated Clark County, North Las Vegas, Boulder City, and Mesquite, Nevada. 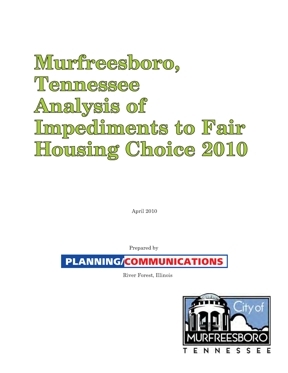 This 140–page study of housing, land use, transportation, employment, demographic economic, real estate practices, mortgage lending, and other factors that influence fair choice housing was published April 2011. Murfreesboro, TN (2010)  Researched and produced Murfreesboro, Tennessee Analysis of Impediments to Fair Housing Choice, a 92page study of housing, land use, transportation, employment, demographic economic, real estate practices, mortgage lending, and other factors that influence fair choice housing in this major Tennessee city that is home to Middle Tennessee State University. Naperville, Illinois (2007)  Researched and produced Analysis of Impediments to Fair Housing Choice in the City of Naperville, Illinois, 2007, a 79page study of housing, land use, transportation, employment, demographic economic, real estate practices, mortgage lending, and other factors that influence fair choice housing in this major Illinois city. Received 2009 Best Practices Award from the Illinois Chapter of the American Planning Association. Oak Park, Illinois  Designed and published awardwinning Comprehensive Plan 1979. Received 1983 Award of Merit from the Illinois Chapter of the American Planning Association. Designed and prepared 1991 revision. 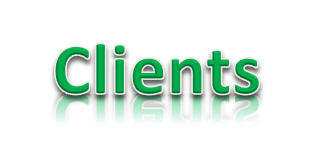 Click here for expert witnessing in group home and fair housing hearings and cases. Hanna v. City of Chicago, Case No. 03 CH 5933, Circuit Court of Cook County, Illinois, Chancery Division; Deposed expert witness for the plaintiff in August 2005. Lawsuit rendered moot when the city rezoned the subject property to is previous designation. Shirley Berry, et. al. v. Town of Tarboro, et. al. (Eastern District of North Carolina, U.S. District Court 4:01CV140H(3) (20022003) Deposed expert witness for the plaintiffs on acceptable zoning and planning practices in exclusionary zoning case. Retained by Land Loss Prevention Project. Settled favorably for the plaintiffs in 2003. Amicus Brief, City of Edmonds v. Washington State Building Code Council, 514 U.S. 725 (1995): Principle author of the American Planning Association's Amicus Curiae Brief on behalf of respondents. Decided May 15, 1995 for the respondents. Several observers of the case believe that this brief is one of several that had a significant influence on the outcome. Prescott, Arizona — Conducted study that formed the basis for zoning amendments we wrote for community residences for people with disabilities (2014–2015) that resulted in the U.S. Department of Housing and Urban Development terminating its investigation charges of housing discrimination filed against the city. These may be the most thorough provisions written to comply with the Fair Housing Act. 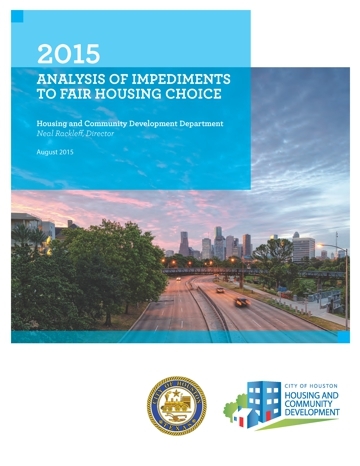 Governor's Planning Council on Developmental Disabilities  Conducted and published scientific study of impacts of group homes on property values, neighborhood stability, and safety in the surrounding neighborhoods. Using sound, scientific methods, this study found that community residences had no statistically significant effect on property values, property turnover, nor neighborhood safety. Includes an annotated bibliography of similar studies from around the country. Sept. 1986. Philadelphia Department of Mental Health and Mental Retardation  Advised planning, law, building inspection, and zoning officials on zoning for group homes. City of Altoona, Pennsylvania (19941995)  Legal consultant to draft comprehensive zoning ordinance amendments to regulate group homes, halfway houses, shelters, and other community residences in accord with the 1988 amendments to the federal Fair Housing Act. Lake County, IL Dept. of Planning, Zoning, and Environmental Quality  Consultant to the defense in unsuccessful court challenge to location of halfway house for prison preparolees. Unity House (20032005)  Represented recovery home for men addicted to alcohol or illegal drugs in zoning matters. Chabad of California (19992001): Provided legal guidance in a variety of zoning and building code matters in Los Angeles, CA, regarding residential rabbinical schools and colleges, drug treatment centers, and recovery communities. Yellow Brick Road Recovery Community (2001+): Represented operator in response to $1,000 ticket from Village of Maywood, IL, for violation of the zoning code. Violation was nonsuited. Dungarvin of Illinois (19981999): Represented group home for adults with developmental disabilities in its efforts to locate in residential district in Cordova, IL (population: 600). Drafted revisions to the village's zoning code which the village board adopted with some changes that made the client's group home a permitted use. 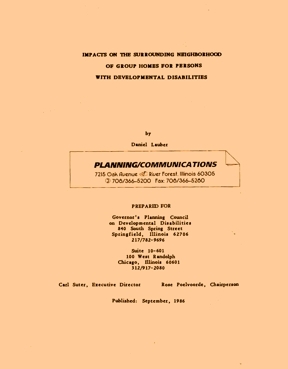 Illinois Planning Council on Developmental Disabilities (19901991): Project to implement Illinois' Community Residence Location Planning Act which required all 110 home rule municipalities to prepare plans showing how they intend to amend their zoning ordinances for group homes to bring them into compliance with 1988 amendments to the federal Fair Housing Act. 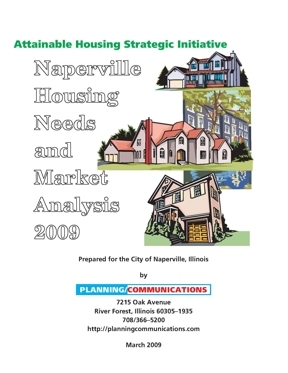 Conducted seven workshops for municipal officials; provided technical assistance to city attorneys and planners; wrote zoning amendments for 11 cities; appeared as expert witness before local plan commissions; wrote guidebook and legal analysis; wrote model zoning ordinance provisions; wrote report for Illinois General Assembly including recommendations for state legislative action; prepared press releases; evaluated 99 ordinances for compliance with the Fair Housing Act's 1988 amendments. This project won the 1991 award from the Illinois Chapter of the American Planning Association for a "Planning Program of Unusually High Merit Performed Under Serious Budgetary, Manpower, or Political Constraints." Dungarvin, Inc. (1993)  Represented Dungarvin before Lakewood, Colorado, zoning board to obtain special use permit for group home for residents with developmental disabilities. Proviso Family Services — Served as attorney and expert witness in public hearing for special use permit for group home for six women with mental illness. After winning approval of Maywood, Illinois, Plan Commission, the Village Board amended the zoning ordinance to make such group homes a permitted use. Dungarvin, Inc. (1991)  Served as attorney to successfully persuade Town of Schererville, Indiana, to withdraw zoning and code objections to proposed group home. Martin Luther Homes  Served as attorney for special use permit hearing for group home for persons with mental illness. United States v. City of Chicago Heights, 161 F. Supp. 2nd 819 (N.D. Ill. 2001  Expert witness for the U.S. Department of Justice on zoning and planning law issues. Deposed in 2000. Identified legal issues that led to district court's summary judgment decision in favor of the United States. Tracey P., et al v. Sarasota County, C.A. No. 8:05CV927JDWEAJ, U.S. District Court, Middle District of Florida  Expert witness for Sarasota County in federal lawsuit; deposed Dec. 20, 2006; case settled Dec. 2007. Rimrock Foundation v. City of Billings, et al, Cause Number CV 06162BLGCSO Expert witness for Billings, Montana in federal lawsuit. Produced expert witness report that helped lead to settlement of the case (2008). Ancheta v. Westborough Homeowners Improvement Association (1997): Expert witness in California state court case involving application of restrictive covenants to group home. Staley, Staley and Huggins v. LB Properties (1992)  Testified as expert witness in successful defense of neighbor effort to overturn ruling by East Peoria Zoning Administrator that group home (RFMS) was a permitted use. Illinois Circuit Court, Case No. 91CH64 (May 19, 1992). USA v. City of Chicago Heights and RFMS, Inc. v. City of Chicago Heights, Civil Action No. 89 C 4981, U.S. District Court, N.D. of Illinois. Settled in favor of RFMS, 1990. Served as expert witness to Rosenthal and Schanfield law firm handling Fair Housing Act lawsuit against Chicago Heights for denying special use permit for group home. Resulted in settlement issuing special use permit for group home and $45,000+ in fines and costs. Center for New Horizons  Served as expert witness before Chicago Plan Commission seeking special use permit to establish a group home for displaced abused boys from the neighborhood; prepared argument portion of brief appealing denial of special use permit. Scheduled to appear as expert witness in court case which was eventually dropped. Cook County Legal Assistance (Chicago)  Expert witness in successful zoning lawsuit to overturn denial of special use permit for day care center. Oxford HouseC. et al. vs. City of St. Louis federal district court (1993)  Testified as an expert witness on behalf of Oxford House, a recovery community for people with alcohol and drug addictions. Marshall v. L.B. Properties, No. 91CH64, 10th Judicial Circuit, Tazewell County, Illinois (1992)  Testified in court as expert witness for group home operator in lawsuit that overturned the city's effort to bar two group homes for adults with developmental disabilities. Knisley v. Morgan County Housing, No. 85CH12, 7th judicial circuit, Morgan County, Sept. 6, 1985. Expert witness for plaintiff Morrissey Construction in Jacksonville, Illinois, lawsuit. Case settled just before trial. Residential Management Services, DuPont, IN (around 1990)  Testified as expert witness in state court on behalf of group home operator charged with violating zoning ordinance. Corporation for Independent Living, Hartford, CT (around 1990)  Testified as expert witness in state court in successful challenge to attempt by condominium to treat group homes as businesses prohibited by condominium bylaws. Clearbrook Center, Rolling Meadows, IL. North Shore Association for the Retarded, Evanston, IL. Macon County Community Mental Health Board, Decatur, IL (1979).